Have you recently started to see an alert indicating that one of your applications is not optimized for your Mac? This is a new alert that Apple added in macOS High Sierra version 10.13.4. This alert appears for older applications, what are called 32-bit applications. It’s important to understand that these older applications will continue to work fine as long as you use macOS High Sierra. Nothing is wrong. Nothing is broken. Apple is just giving users a heads up. In 2017, Apple announced that macOS High Sierra would be the last version of the Mac operating system to support 32-bit apps without compromise. The meaning of the phrase “without compromise” is not entirely clear. It might mean that 32-bit applications will not work at all with High Sierra’s successor, or it could mean that they might work but with some limitations. Thus, it’s time to either upgrade or replace your older 32-bit Mac apps. The System Information application will open. Scroll down to the Software section, in the left-hand list. Within the Software section, click on Applications. Wait for a list of all applications on your Mac to be created. Click on the column header named 64-bit Intel. By clicking on the column header, you’ll sort the report by this column. All non-64-Bit applications will then be grouped together. 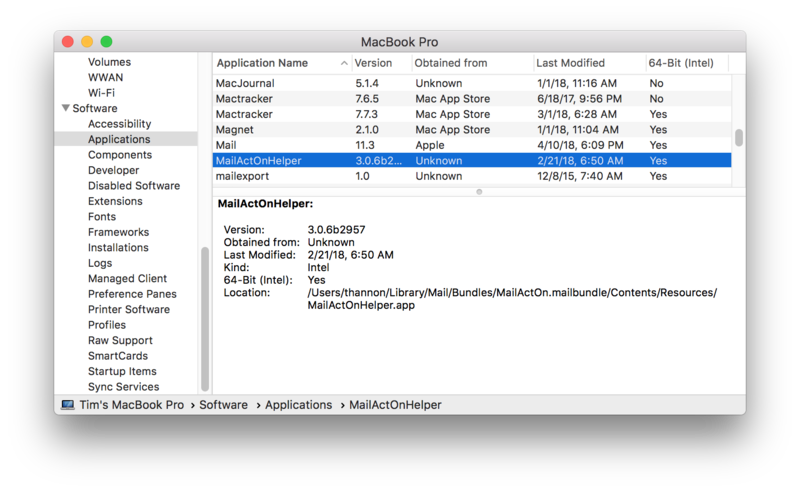 In the image below you can see that MacJournal version 5.1.4 is not a 64-bit app and neither is Mactracker version 7.6.5. However, you’ll see that I also have Mactracker version 7.7.3 installed and it is a 64-bit app. In this case, I should delete Mactracker version 7.6.5 and contact the developer of MacJournal to see if a newer version, a 64-bit version, exists. If you no longer use an older, 32-bit application and you want to remove it, then you should note the application’s location. In the image above, look for the “Location” section. This will tell you where the application resides on your Mac. Many, but not all applications will reside in your Applications folder. Many applications can be deleted by dragging them from the Applications folder to the Trash. Some applications may have specific applications used to remove them. If you’re not sure how to remove an application you can contact the developer or look for instructions on the developer’s web site. Read more about 32-bit, applications, apps, mac, upgrade.